John Cleese was an outsider in school, and generally sat back and observed, developing his knack for subversive mockery. His father sold insurance, and his mother, Cleese has said, was "classically self-centered... And she lived to 101 -- I thought I'd never get rid of her". As an alleged grown-up, Cleese worked as a math teacher, then studied law at Cambridge, but quit his studies to join the Footlights comedy troupe, where he first met Graham Chapman. Cleese wrote for the original British That Was the Week That Was (not the less-inspired American copy), and worked with Eric Idle, Terry Jones, and Michael Palin on David Frost's satirical Frost Report. In 1968 Cleese pioneered the mockumentary with How to Irritate People, and he later wrote for Doctor in the House and The Two Ronnies. Cleese was a founding member of Monty Python's Flying Circus in 1969, along with Chapman, Idle, Jones, Palin, and Terry Gilliam. 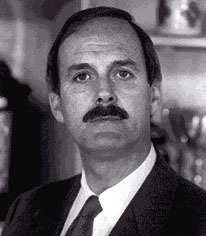 Cleese stayed with the show for three of its five seasons before feeling that the comedy had declined, and cordially drifting away. He did, of course, return for all of the group's subsequent films and TV specials, and appeared in many of his fellow Pythons' projects. Cleese has said that Fawlty Towers, his classic sitcom about a poorly-run hotel, was inspired by his stay at a hotel in Torquay, Devon, managed by an remarkably ill-tempered man. Written by Cleese and his wife, the series was actually comprised of two separate mini-series, six episodes made in 1975, and six more made in 1979 due to popular demand. After that, as with the Monty Python series, Cleese again felt the concept had peaked and that future episodes couldn't measure up. He has since evolved into a character actor, equally adept at dry delivery or comedic roles. In the 1999 James Bond film The World Is Not Enough, Cleese played "R", the assistant to Desmond Llewelyn's "Q", the gadgetmeister. With Llewellyn's death, Cleese's character was promoted, becoming "Q" in 2002's Die Another Day. To a younger audience, sadly, Cleese is perhaps best known as Nearly Headless Nick from the early Harry Potter movies. Outside of these franchises, he wrote and starred in the farcical caper comedy, A Fish Called Wanda. In 1971, Cleese founded Video Arts, a company that produces serious (albeit humorous) business training and orientation films. He is co-author of Libel Suits and How to Win Them, and Life and How to Survive It. In 1996, Cleese quietly declined nomination for knighthood.